While almost everyone knows that changing your car’s oil is important, many drivers don’t know how often it should be done. Some go by the “four seasons” rule (change your oil with the change of the seasons), while others change it when they remember. The best place to start looking for answers is in your car’s owner’s manual. Here the manufacturer will make a recommendation on not only how often to change your oil, but also what type of oil to use in your engine to make your car run at peak performance. Typically this number falls between 5,000 – 7,000km, though it can vary. How old is your car? – As cars continue to be upgraded, engines continue to advance and run more efficiently. If you’re driving an older car, you may need to change your oil more often. What type of oil are you using? – Full synthetic oil and synthetic blends tend to last longer than conventional oil. What are your driving habits? – People who drive in the city, with constant stop-and-go traffic patterns, need to change their oil more often than those who do more consistent-speed highway driving. If you do a lot of off-road driving, or driving in dusty conditions you may also want to consider changing your oil more frequently. How often are you hauling or towing? – Drivers who carry heavy loads probably need to change their oil more often, as the engine must work harder to pull the extra weight. What’s the weather like? – Believe it or not, extreme heat or cold also can affect your oil’s lifespan. Cold climates can increase the amount of condensation in the oil, which is a prime source of contamination. Extreme heat leads to the oil breaking down faster, resulting in the need for more frequent oil changes. 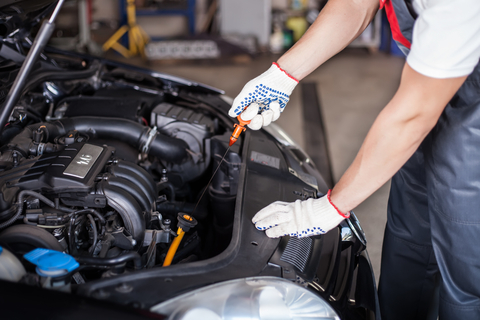 After considering these factors along with the owner’s manual recommendations, you should have a good idea of how often to get your oil changes. If you’re still unsure, check your windshield! Chances are there’s a sticker there from your last oil change, recommending the odometer reading and/or date for your next oil change. If you’re still unsure, get your oil checked. A professional can let you know if it’s time for an oil change. If you find yourself well overdue for an oil change, get in touch with Park Muffler today!